Toyota commenced its operations in India in December 1999. Toyota Motor Corporation is one of the top automobile manufacturers across the globe. Toyota has 53 automobile manufacturing firms in 28 countries and its products are sold in over 170 regions. Why is it Important to Insure Your Toyota? As per the Motor Vehicles Act of India, it is mandatory for all the vehicles plying on the roads to be insured with at least a third-party liability cover. Also, having a car insurance protects you from liabilities that you may incur due to an unfortunate mishap. *Please note that the above prices are exclusively for New Delhi and are subject to change with respect to the city you purchase the vehicle from. 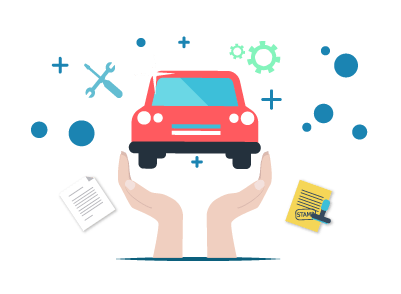 Comprehensive car insurance, also known as Other Than Collision cover is a car insurance policy that offers extensive insurance coverage over third-party as well as own damage liabilities. Third-party Liability cover is a car insurance policy that offers limited coverage over third-party liabilities alone. You can visit third-party insurance websites or insurer’s official websites to purchase or renew car insurance. The online platforms have a built-in tool called premium calculator that gives you an estimate on your insurance premium. You can also visit the nearest branch office of the insurer or meet with an insurance agent to purchase or renew car insurance. After registering your claim request, provide the requested details to the insurer with regards to the mishap. An authorised surveyor will be sent by the insurer to inspect your car and assess the total damage/loss incurred. You will have to submit the copies and originals of the requested documents to the surveyor. The surveyor post inspection will submit the incident survey report to the insurer, who after inspection will start processing your claim request. In case of a cashless claim, take your car to the nearest authorised garage and get it repaired. After the repairs are done, the insurer will pay for the complete repairs directly to the garage. In case of a reimbursement claim, take your car to the nearest garage and get it repaired. After your car has been fixed, pay for the repairs yourself and submit the supporting invoice and payment receipt to the insurer for verification. Post verification, the insurer will reimburse the amount you spent on the repairs. Total loss due to fire, terrorist attack, theft, etc. What needs to be done in case a mishap takes place outside of the specified geographical location? Inform the insurer as soon as the mishap takes place and act as per the insurer’s advice. How can I add/delete the Hypothecation in my car insurance policy? In case you need to add Hypothecation, you need to submit the concerned bank’s letter or a copy of your endorsed RC to the insurer. In case you need to delete Hypothecation, submit the NOC or a copy of your endorsed RC to the insurer. No Claim Bonus is a discount on the insurance premium awarded by the insurer to the insured for every claim-free year. In case I have been driving a company car, can I use the No Claims Bonus that have been earned on the car’s insurance policy? You can use the NCBs accumulated on the car insurance policy of the company car provided the vehicle is transferred in your name. Can I renew my already expired car insurance policy? You can renew your car insurance policy after its expiry, provided the insurer has inspected your vehicle and given approval. You may be charged additional premium if the policy expired 45 days earlier. The car manufacturing major, Toyota, has planned to release new cars such as Avanza, Rush, and Alphard MPV as well as launch a new subscription-based car ownership program in the country. The company has already designed a working model of this probable program in Japan. Since India is becoming more and more open to shared mobility, the company sees good opportunity in launching the facility here. Other manufacturers, Skoda and Mahindra have already announced such ownership programs in the country. The lease system will enable individuals to get cars such as the Innova Crysta or the Fortuner for a temporary time period as decided by the company and the individual. Since cars are mostly perceived as a status symbol in India, the lease-based ownership may not strike a chord with all the citizens in the country. People who reside in metro cities are expected to be far more open to such ideas, given the success of rental cars and shared ride concepts. The smaller towns may take a little more time to accept the new concept. Toyota after launching Toyota Yaris has not seen any profits regarding the sale of the model. In order to ensure that more people in India purchase Toyota Yaris, Toyota dealership is offering discounts on the model. Toyota Yaris which competes with models like Hyundai Verna, Honda City, and Maruti Suzuki Ciaz is being offered by the automobile company at a discount of R.1.5 lakh. Free insurance, exchange offer, discount on cash, and other free accessories form the part of the discount offer. The Toyota dealership is also offering a free gold coin to those who purchase the model. The automobile company had enjoyed decent numbers when the Toyota Yaris was launched. The automobile company had sold close to 2,000 units on a monthly basis initially when the model was released. However, the numbers plummeted as the month of January 2018 saw only 343 units being sold. It was the lowest monthly sales recorded by Toyota which also put Yaris behind Volkswagen Vento and Skoda Rapid. One of the reasons why Yaris has experienced low sales is due to it not having a diesel engine. The model’s other competitors - Honda City, Maruti Suzuki Ciaz, and Hyundai Verna come with diesel engines. Japanese automaker Toyota has launched its all new Camry Hybrid in India for a price of Rs.36.95 lakh (ex-showroom). The vehicle comes with a new design called the ‘Keen Look’ design, which makes it look sharper than ever. The company has used its flagship platform TNGA (Toyota New Global Architecture) for this model. The same platform has already been used in many other modern Toyota models and Lexus ES 300h. Coming to the technical specifications, the Toyota Camry Hybrid features a 2,487 cc, 4-cylinder engine that produces an output power of 176 bhp. Along with the fuel engine, the electric motor in the vehicle delivers an output of 118 bhp and 202 Nm torque. The vehicle also comes with a 6-speed CVT transmission. The design of the vehicle has undergone a massive change. The Toyota Camry Hybrid features bi-beam LED projectors in its headlamps along with three additional lamps for daytime running. The interiors of the vehicle have been redesigned completely, and the infotainment systems are upgraded to the latest technology. A total of 10,799 units of the Toyota Yaris was sold in 2018 since its launch. The sedan was launched by Toyota Kirloskar Motor in April 2018. Although the Toyota Yaris initially received positive response from car buyers, the company was only able to sell around 389 units in December 2018. Due to the tough competition faced, Toyota Kirloskar Motor has been offering discounts on the Yaris. The sedan is currently being offered with benefits worth a total of Rs.1 lakh. These discounts are offered in the form of free accessories worth Rs.42,000, an exchange bonus of Rs.30,000, and insurance coverage worth Rs.18,000. Certain automobile dealerships are also offering an added discount of up to Rs.30,000 to car buyers. The Toyota Yaris, which has a petrol engine, is powered with a naturally-aspirated, 1.5-litre petrol engine that can produce a maximum torque of 140 Nm and power of 108 Ps. All variants of the sedan come with disc brakes on all the wheels and seven airbags. Further, the sedan also has an electronic brake-force distribution (EBD) and anti-lock braking system (ABS). The car also features proximity sensors, traction control, ISOFIX child seat mounts, electronic stability control, tyre pressure monitoring system (TPMS), hill hold assist (HHA), and reverse parking sensors and a camera.